Life is a series of great adventures. To achieve your financial goals along the way, you need a partner you can count on. Whatever your new adventure is, see it through with Passumpsic Bank. Your community bank. And so much more. Passumpsic Bank is committed to providing you with the products and services you need, backed by the expertise and guidance you deserve. Founded in 1853 and still growing strong. You can depend on Passumpsic Bank. We’ve updated our brand! New logo, new colors, new energy, from the folks you know and trust. We’re always looking for opportunities to enhance our presence in the regions we serve. Hello, friend! Discover personal banking the Passumpsic way. What are your goals? The more we know, the more you’ll grow. Choose from a variety of products including money market accounts and certificates of deposit, and watch your business thrive. Have you heard about our Kasasa® Checking & Savings accounts? We have teamed up with Kasasa® to offer checking and savings accounts with even more benefits. * Annual percentage rate (apr) is based on $100,000 loan amount with 20% downpayment. loans with LTV’s greater than 80% require private mortgage insurance. On March 27th @PassumpsicB Jessica Kimbell, Business Banking Officer, and Jackie Greaves, Commercial Banker, enjoyed exhibiting at the VT Leagues of Cities & Towns Strengthening Communities for the Future event at Burke Mountain. @PassumpsicB is a proud supporter of the event. Passumpsic Bank is excited to announce that we received the Vermont Governor’s Excellence in Worksite Wellness Award for our employee New Year, New You program. This is the 5th year Passumpsic has won this award. 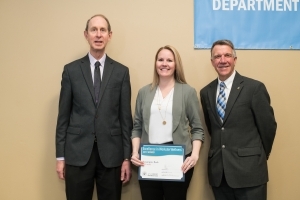 Pictured are: (L-R) Dr. Mark Levine/Vermont Commissioner of Health joins Kristina McLaughlin/Passumpsic Bank Human Resources Representative and Vermont Governor Phil Scott to accept the Excellence in Worksite Award. The Vermont Department of Health, together with the Governor’s Council on Physical Fitness and Sports, annually recognizes businesses for promoting health and wellness at their workplace.